Do you have an older sibling? I am the oldest in my family. I have to admit, I never really paid attention to how my little brother reacted to me when we were really young. As a mommy, I have been watching my little guy try to follow his big brother around. If NHL does something, JSL wants to do it. A week before Labor Day the boys were outside. I asked JL to bring up NHL’s old push to ride Fisher Price bike to see if the little guy would like it. For some reason we could not get the push handle back on the bike. I told JL just to take it outside to see what JSL would do. Sure enough he loved it. He was "walking" his bike all over the place. He did not stop moving for most of the time he was outside. He had a blast chasing after his big brother and daddy. There was a little problem, JSL had no real shoes at the time. At that point he was not really walking on his own, so he only had the soft bottom shoes. His froggy shoes were in rough shape anyway, so we just let him use those. Two days later we went to the doctor for JSL’s 15 month visit. I asked the doctor if we should get him shoes since he was basically ready to walk. She said it was probably a good plan for when he’s outside, but for indoors it did not really matter. That night we packed up the boys and went to get some shoes. We bought NHL a pair of black tie shoes for the Jewish holidays and to have something other than sneakers. And below are JSL’s sneakers. Labor Day weekend JSL finally started to walk around on his own. Since that time he has gotten better at balancing and can go for much longer distances, bend to get things, and turn around while walking. The problem has been he does not like to walk in his shoes. He was so used to walking with naked toes that the clunky nature of sneakers throws him off. This weekend we took the sneakers back out again. This time we held his hand and he tolerated the shoes. Last night he was started to get a kick out of wearing them and walking around stores and things with an adult hand. Today I figured out how to get him to nap in the afternoon. We arrived at school about a half hour before NHL was getting out. I parked the car down a side street and JSL and I walked to school. Thanks to the sidewalks we went all over the place. We walked and walked and walked. The smile on his face as he looked up to me while holding my hand was priceless. I promise, I will get a photo of that soon. When we got back home he was so exhausted he slept for almost two hours! 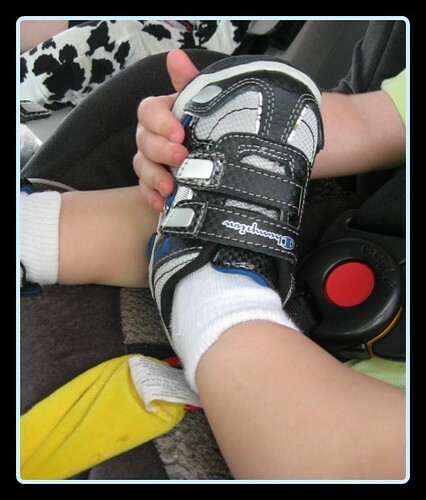 As you saw in my LJ, we just got Nati his first pair of shoes… I SO miss Payless. My FIL is coming in November and I’m tempted to order some shoes online and have him bring them. Aww….how cute. They just grow up too fast! Look at his little bitty shoes..I miss mine being that age. Smart thinking with the walking…exercise is good for both of you and then a nap too. Woo Hoo! 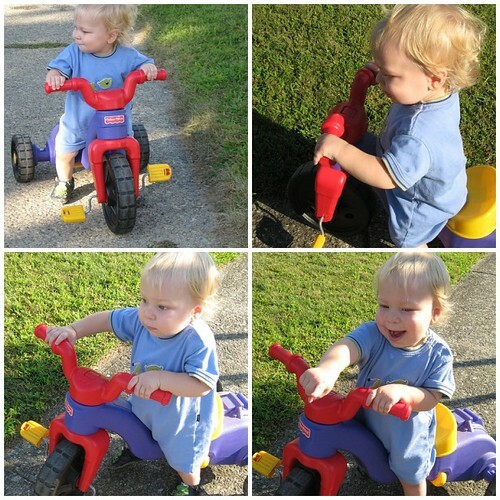 We have that trike too, we took it out for Zach a while ago and he was a bit too small for it. It’s set up as a rocker now in the living room. I’m hoping to get him a Radio Flyer trike for his birthday that he can use next year. Love him on the little trike! Aw, baby shoes …. sniff sniff. We have that same trike! Good for him! I love him on the big wheel!